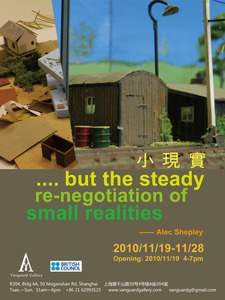 The show '......but the steady renegotiation of small realities', accompanied by a publication in the form of a limited edition book, contributed to an ongoing investigation into notions of the unfinished or incomplete project. Referencing often broken and damaged structures associated with architecture and painting, the exhibition represented a 'paused project' and comprised a number of provisionalised audience engagements seemingly by several different artists. A wall-based grid work with enough spaces to show one hundred drawings of small piles of debris, but actually only showing fifty drawings and fifty empty spaces, appeared to be a work in progress. The drawings, each measuring 50cm x 20cm, were etched onto glass and had been made on a laser cutter. The glass was set 5mm above the back board of the frame and so the actual ‘drawing’ appeared as a transient shadow on the back panel of the frame. The drawings drifted in and out of view with any changes to the light levels in the gallery space. The ephemeral shadows alluded to the absence of drawings in the gaps in the grid. The suite of drawings also echoed a pile of broken model houses in the form of a tableau, on the opposite side of the gallery. This tableau was reminiscent of a traditional still life that comprised broken model houses and four light boxes, each of which contained computer generated architectural form with a distinctive and celestial ‘skin’. Also included was a video loop of a woodland glade in early evening which was evocative of a painting by Poussin or Claude – but uninhabited. The photographic piece was accompanied (although not overtly in a literal/physical sense) by a two track video installation in the adjoining gallery space. The two video pieces were filmed in the late afternoon/early evening at two different municipal recycling centres at two different geographical locations. These centres are often found on so-called brownfield sites or ‘unwanted’ land in and around urban/suburban centres. The looped films showed a continuous engagement with unwanted material and objects associated with domestic living.